Decisively Middle Eastern influenced, the Israeli-born members of Emok have come to Brooklyn, NY to further the musical mission of fusing the sounds of their homeland with the pulsating offerings of upper tier metal and the nuances of noise rock's elite. On the trio's 12-track endeavor, there's a slew of System of a Down meandering in between meaty Helmet structures and industrial metal's mechanical rhythmic movements all over tracks like "Guilt" and "Field of Thorns", not to mention substantial amounts of the outfit's traditional roots shining through tracks like "Kasha" and "Bliss". "Hatred Grows Old" shares the Soulfly vibe, while the pummeling electronic groove of "Turn Off the Lights" smacks you down like early NIN. 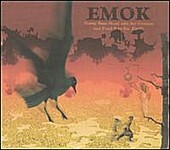 Emok's multi-faceted metallic journeys exhibit the type of band that has the lineage and ability to pull off a hybrid form of music with tact and conviction.